More than 70% of UK households now access broadband services based on either BT's or Virgin Media's networks. The milestone was announced as BT passed the 15 million mark for the number of premises connected over its network, either through BT's retail service or through ISPs accessing the national backbone. Together with Virgin Media's cable network, that means more than 19 million UK premises use broadband - equivalent to 71% of the total, ahead of France, Germany and the US as a proportion of households. "Broadband Britain has been a success story with widespread availability, low prices and high take-up," said BT strategy director Olivia Garfield. 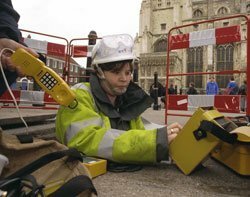 "BT is now investing a further £2.5bn to roll out fibre broadband to two thirds of the UK. This will help the UK climb the league tables for speeds, one of the few areas in which we don't lead the world". The government has promised access to a minimum 2Mbps broadband network for every premise in the UK by 2015, but there remains much debate about the roll-out of next-generation high-speed broadband, with BT and Virgin Media likely to cover only the areas of the country where it is commercially viable to offer such a service, with many rural areas fearing they might miss out.